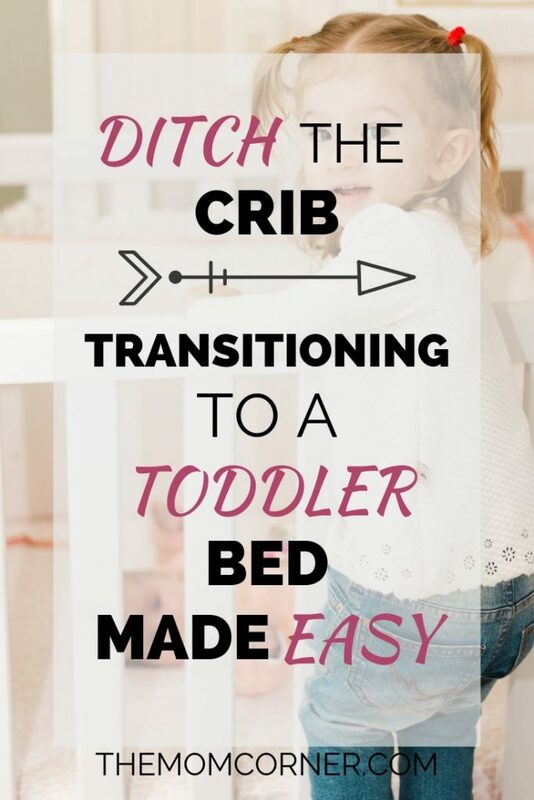 Transitioning to a toddler bed is a big milestone for your little one! While sleeping in a big boy/girl bed is a big step in growing up, it can also bring with it a lot of anxiety for your little one. Not to mention a lot of hair pulling for mom and dad when your little one refuses to stay in bed! Just recently we transitioned our little guy to a toddler bed at just 17 months old. Although most toddlers are able to stay in their cribs longer than that, our little guy, Elijah, has his daddy’s height. By 17 months old, he was tall enough to get his foot up and over the crib rail. 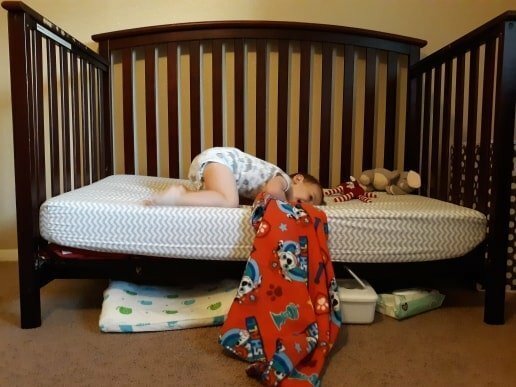 And as soon as he figured out that he was capable of that, we knew it was time to switch to a toddler bed before he tried to climb out on his own and got hurt. 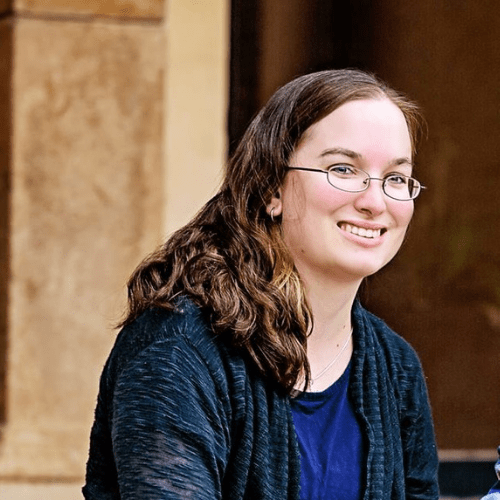 I’m going to share with you some of the things we did to make the transition as smooth as possible. 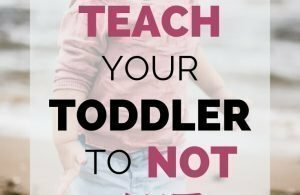 Is My Toddler Ready For A Toddler Bed? 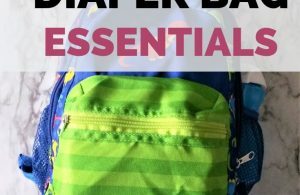 Before we get into my tips for toddler bed transitioning, maybe you’re wondering if your little one is ready. My first suggestion would be to look at the height and weight limits of your crib. While Elijah is far from maxing out the weight limit, he reached the height limit by 17 months old. Also take into consideration whether your child is trying to get out of their crib. If your toddler isn’t attempting to escape, I would recommend letting them stay in their crib for the time being. For us, we knew Elijah would need to switch sooner rather than later because of his height. But we didn’t make the move until he showed signs of actively trying to get out on his own. If possible, I recommend using a convertible crib to make the transition an easier one. The crib we have for Elijah is a Graco Freeport 4-in-1 convertible crib, which allows you to turn it into a toddler bed by removing the front bar. I really think converting his crib to a toddler bed helped him to transition easier. He already knew that his crib was for sleeping, and he didn’t need to relearn where he was supposed to go to sleep. I think he would have had a harder time transitioning if we had gotten him a separate bed to sleep in. Especially since he’s still so young and is still working on communicating clearly with us. So, if you have a convertible crib, I recommend converting it to a toddler bed until you’re little one gets use to it. If not, you might try having your child take naps in the toddler bed, and then sleep in the crib at night until he/she gets the hang of it. 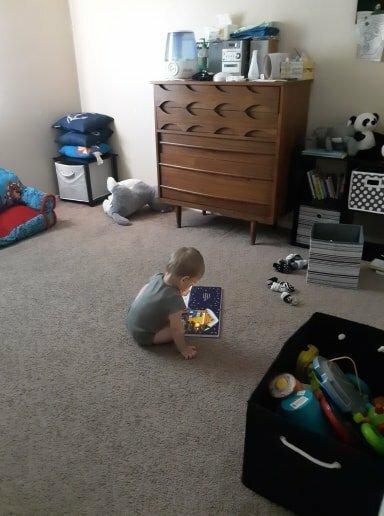 One thing we did when we transitioned to a toddler bed was allow Elijah time to explore. When we took the front bar off his crib, he was very excited that he could get on and off his bed all by himself. Allow your child time to explore their new bed and get comfortable with it. That way, when it’s bed time, your little one will feel more comfortable with the new arrangements. Probably my number one tip for transitioning to a toddler bed is to keep the rest of your routine the same. 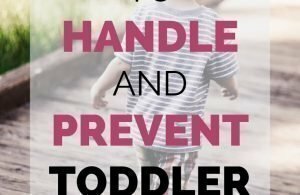 Don’t try to make multiple changes to your toddler’s routine or setup all at once. For example, we’ve successfully gotten Elijah to give up his pacifier during the day. Now we’d like to get him to learn to sleep without it as well. But, we transitioned to the toddler bed first. Rather than trying to get him to sleep in a new setup and give up the pacifier at the same time, we’re allowing him to keep his pacifier until he completely adjusts to his new bed. Later on in the summer we’ll work on ditching the pacifier, after he’s fully adjusted to sleeping in a toddler bed. Instead of making multiple changes, make one and keep the rest of your bedtime routine the same. Okay, so you’ve transitioned to a toddler bed. But now your toddler won’t stay in bed! What are you supposed to do now? Teaching your toddler to stay in bed is an inevitable, necessary evil that comes with toddler beds. Do your best to be patient–it’s all new to your little one. Your toddler is probably excited about their new found freedom to get out of bed on their own. Now they just need to learn when to exercise that freedom. Try to avoid getting frustrated at them quickly during this process. The more patient and calm you are, the easier it will be and the quicker they will get the idea. When your toddler does get out of bed, calmly get them back into the bed. Tuck them back in, tell them it’s bedtime and that you love them, and then leave again. It may take multiple times of doing this, but eventually they will stay there and go to sleep. Just do your best to not get frustrated about it. It will take time, and likely several nights until they start to get it. But they will learn, if you stay consistent. Try repeating part of your bedtime routine if your toddler won’t stay in their bed. Maybe that means reading a short book, tucking back into bed, saying goodnight, etc. 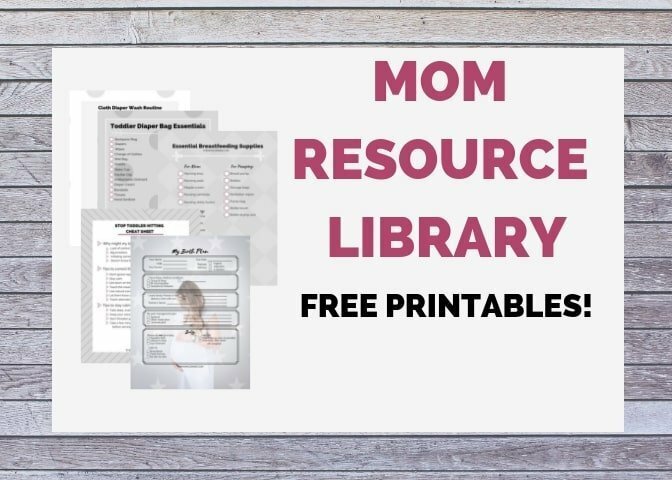 Don’t feel like you have to read a book every single time you put your toddler back into bed. Doing this may cause your child to think that getting up will get him what he wants–another bedtime story. But if you keep putting your child back into bed and he keeps getting back up, try repeating part or all of the bedtime routine to “reset” so to speak. Doing so may help to remind your little one what time it is and what they are supposed to be doing. If you’re getting frustrated–and I don’t blame you–consider allowing your child to quietly play in their room. Since our toddler is only 17 months old, we put up a baby gate in his doorway to prevent him from wandering the house in the middle of the night. This keeps him confined to his room when we put him to bed, even though he can open his door by himself. Some times when he gets back out of bed at night, he starts playing with some of his toys. And sometimes, we allow him to if he is being quiet. Remember, you can’t force your child to sleep. Despite everything you can do to encourage it, it is ultimately their decision to sleep or not. Sometimes, allow them to play quietly helps them to realize that they are tired. On several occasions we’ve heard Elijah get up and start playing in his room, but have let him be. Usually, it doesn’t take too long before he gets tired and makes his way back to his bed. We have yet to find him asleep anywhere but his bed. I think this is probably because he knows that’s where he sleeps, and always finds his way back into bed once he’s tired enough to give up playing. Don’t get discouraged by transitioning to a toddler bed–especially if your toddler doesn’t want to stay in bed! It’s a lesson that is learned with time and consistency. Your little one will catch on. It has no reflection on you–you’re doing great, after all!